At the Hyster Europe stand, visitors saw two of the latest trucks to join the full line of Hyster® warehouse solutions, the new S1.0E-1.2E Compact Stacker truck series for optimal manoeuvrability and the tough Hyster® RS1.6 Rider Stacker truck, which features an innovative seat with a choice of three driving positions. The J1.6XN Electric Counterbalance lift truck with an integrated 48V lithium-ion battery solution was on show. Along with a choice of flexible side battery exchange options for electric lift trucks up to 3.5-tonnes, this demonstrates another way for operations to manage their power options for Hyster® trucks. 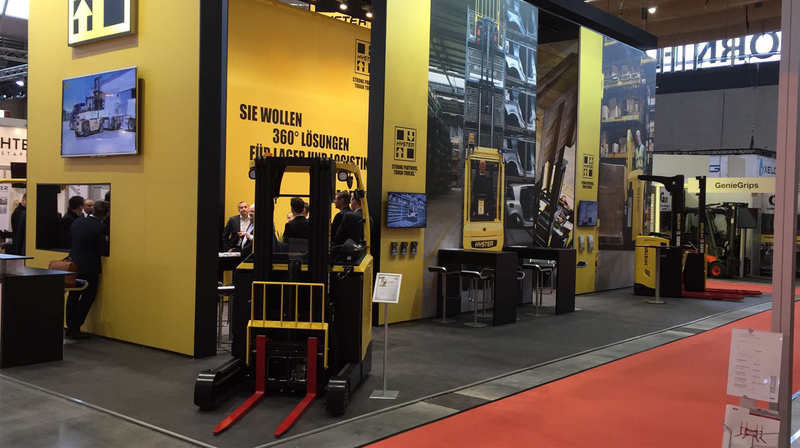 In addition, the Hyster Europe stand showcased capabilities for supporting specific industries. 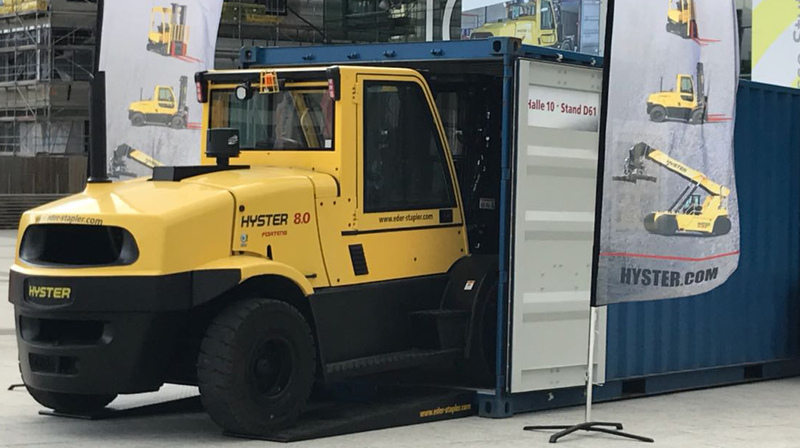 Outside at the show visitors had the opportunity to see a new low cabin option on a Hyster® H8.0FT forklift truck, ideal for container stuffing operations in ports and inland terminals. The Hyster® ‘Cool Truck’ package, designed for demanding applications in the paper, recycling, waste and wood applications was also shown. Plus, new 360-degree technologies such as “affordable automation” and self-drive lift truck solutions – ideal for the automotive industry. For the first time, Hyster Europe also previewed the R1.4E Reach Truck. Currently in development, the R1.0E, 1.2E, 1.4E Reach Truck models are designed for medium intensity operations, such as those in a retail environment. The worldwide network of local Hyster® distribution partners helps applications find solutions to their daily operational challenges. For example, by using the innovative Hyster® warehouse simulator which helps applications to choose the right configuration of forklift trucks for their operation, taking into account a variety of realistic scenarios. 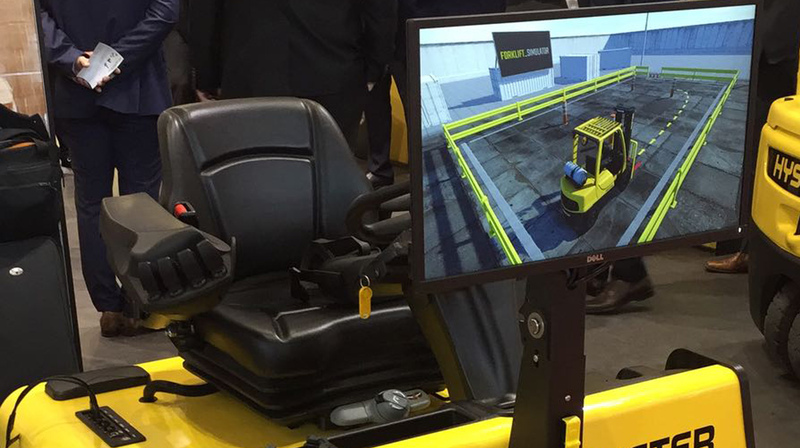 Another type of simulation was on display at the Hyster Europe stand, where visitors had the opportunity to try a realistic 3D forklift simulator. 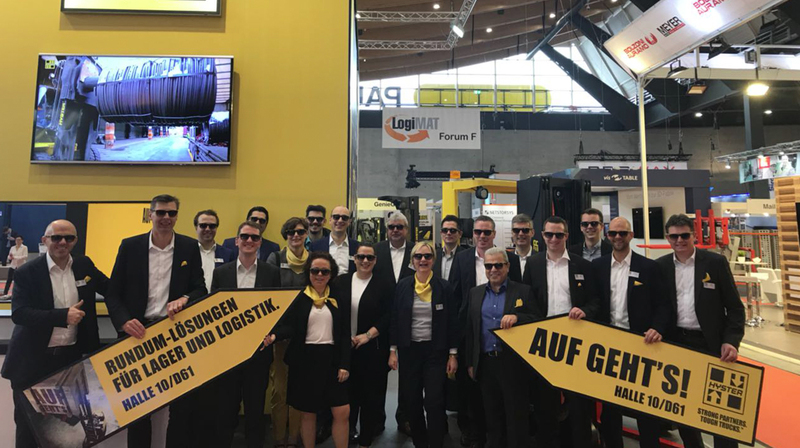 For more information on Hyster® solutions for intralogistics and specific industry applications, contact your local Hyster® distribution partner or visit www.hyster.eu. This entry was posted in Approved used, Batteries, Big Trucks, Container Stuffing, Cool Truck, Counter Balance, Cross-Docking, Dealers, Electric, Electric Big Trucks, Electrics, Events, Hand Pallet Trucks, Hydrogen Fuel Cells, Hyster Tracker, LI-Ion, Lithium-ion, Lowered Cabin, Partners, ReachTruck, Solution, SpaceSaver, Telemetry, Warehousing, Wireless Asset Management, XT, Zero Turn Radius Axle, zero-emission and tagged 3D Forklift Simulator, Compact Stacker, Cool Truck, Electric Counterbalance, Forklift Truck, Germany, Hyster, Lithium-ion, LogiMAT, Reach Truck, Rider Stacker, Self-Drive Lift Truck, Solutions, Stuttgart, Warehouse Solutions. Bookmark the permalink.